Accueil » Actualité du logement » Paris:Les #OubliésDuLogement devant le logement de fonction de M. Benalla ! 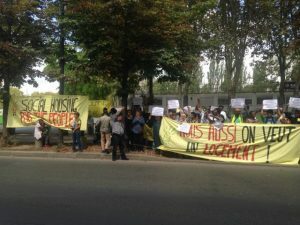 Paris:Les #OubliésDuLogement devant le logement de fonction de M. Benalla ! Les Oubliés du Logement ont obtenu un rendez-vous avec la préfecture de région au sujet du relogement des familles ET un rendez-vous au ministère du Logement! Nous quittons le quai Branly, mais la lutte continue! Elles ont des demandes de logement social depuis des années, beaucoup sont reconnues prioritaires DALO. Suite à la mobilisation, celles qui étaient à la rue sont hébergées depuis jeudi dernier et un rendez vous a été obtenu avec la Mairie de Paris. De son côté, la Préfecture de Région n’a proposé que 30 relogements ! Et les autres ??? L’Etat a la responsabilité de l’application de la loi DALO, du droit à l’hébergement, de la loi de réquisition ! Nous aussi nous voulons être relogés!!! Those Forgotten from Housing set up their bivouac in front of Benalla‘s former official accomodation ! We, those #ForgottenFromHousing, are 300 families who have been taking turns to camp since the 4th July, first on the place de la République, then on the Champs-Elysées, then in front of the Prefecture of Region and in the Parc des Explorateurs by the French Senate. We are poorly housed families, homeless, threatened with eviction, exploited by slumlords, in overpopulated dwellings, sleeping here and there at relatives or in hotels. We have been applying for social housing for years, many of us work, and many of us have been accorded priority by the Prefecture, which means that the State has the obligation to rehouse us, it is the law! But the state does not meet its obligations and despite all the procedures we have been going through, our rights are not enforced and we are forced to live homeless or in slums with our children. We have set up our bivouac today in front of the former official accomodation of Mr. Benalla, advisor of Emmanuel Macron indicted and questioned by a judge for “collective assault by a person in charge of a public service mission“, “usurpation of the functions of a police officer“,”illegally wearing a badge reserved for public authorities” as well as “complicity of concealment of images from a video surveillance system“, after he was identified in a video showing him grab a young man by the neck and hit him several times after a demonstration last May. We want a house as well ! The State is responsible for the enforcement of the DALO law, for the right to accommodation, for the law on requisitions! We demand the enforcement of the existing laws! We ask for the relocation af all!